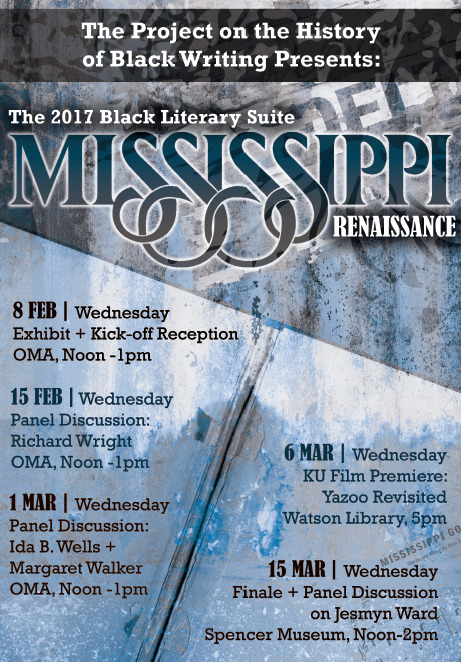 We coined the term “Mississippi Renaissance” to highlight the importance of Mississippi to Black writing and culture, and to place this movement in conversation with earlier renaissance efforts. We explored the commonalities in form, content, symbols found in Black Mississippian texts and how they have changed over time. We questioned what are the historical social conditions of Mississippi that heavily influence black writing, and how the classical meaning of “renaissance” is applicable. On display at the Office of Multicultural Affairs (OMA) through the end of March, we are featuring 10 foundational writer and activists of the period. Join us for our Kickoff Reception at OMA on Wednesday, February 8th starting at Noon. Every Wednesday between Feb. 15th and March 15th from Noon - 1pm we will be moderating panel discussions on different key figures of the Mississippi Renaissance. To compliment our panel discussions, we are hosting four Twitterchats every Wednesday starting at 8PM(est) / 7PM(cst). You can follow us @ProjectHBW and follow our hashtags #BlackLitSuite and #HBW. KU premier of Yazoo Revisited with filmmaker David Rae Morris (discussion and reception to immediately follow) on Monday, 3/6 at Watson Library starting at 5pm. The KU Bookstore has created a Mississippi Renaissance display of featured books for purchase so you can continue your exploration of this period and its impact. Also, we are creating a Mississippi Renaissance Syllabus. This wide-ranging electronic source list will help educators and scholars alike to reflect on this literary period, and incorporate its works into your future lesson planning. Co-sponsors: Office of Multicultural Affairs, Spencer Museum of Art, KU Libraries, KU Bookstore, EGARC, and the Vice Provost for Diversity and Equity.